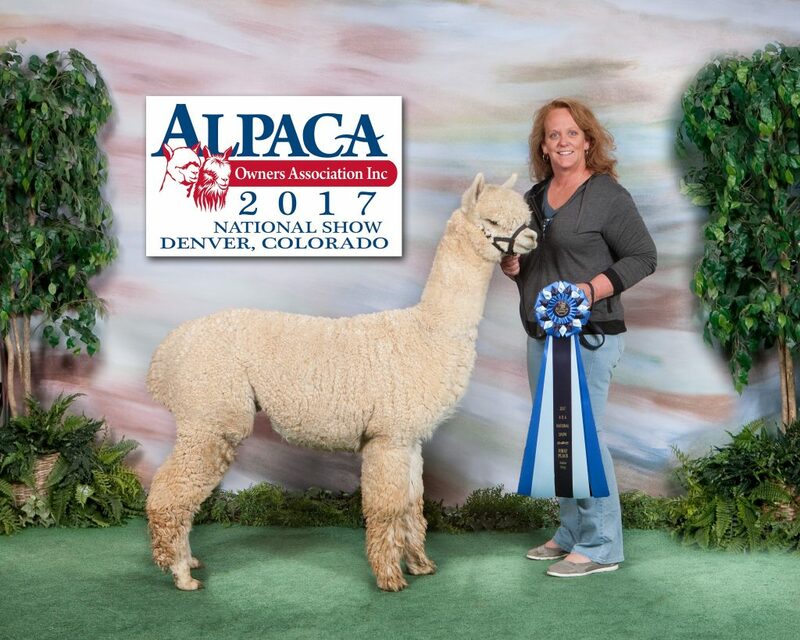 Quech22, described by AOA Judge Ursula Munro as a "ridiculously elite" son of, according to Snowmass Alpacas, "the most distinguished White Huacaya Stud standing in the WORLD" (Snowmass Elite Legend). Quech's Dam, originally from Snowmass, was one of the top 5 foundation females at Futurity Breeder of the Year - Tripping Gnome Farm - and her offspring were acquired by farms like Double O' Good, Cas-Cad-Nac, & Magical Farms. Quech22 lives up to his sire's reputation and combined with his dam's elite genetics, he's ready to produce progeny that continue the family legacy of being the most distinguished in the world for years to come. Everyone knew he would be special from before Quech22 arrived. The breeding of his parents was a dream brought to reality by former AOA judge Ursula Munro of Tripping Gnome Farm (2010-2012 Futurity Breeder of the Year), and co-owner of Snowmass Elite Legend at Quech22 conception. 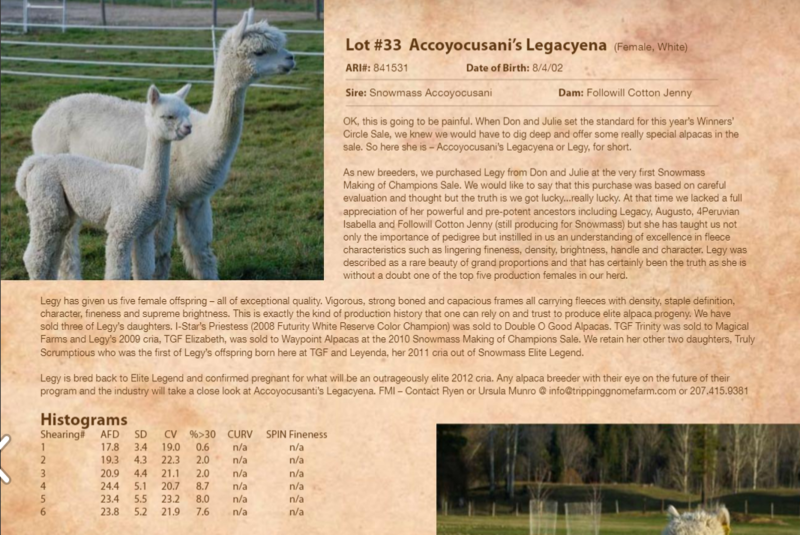 In the 2012 Snowmass Winner's Circle auction listing, she described the unborn cria (Quech 22) as "outrageously elite". Mom was acquired by Hummingherd Farm at that Snowmass 2012 Winner's Circle Auction (see photos for mom's auction listing), just months before Tripping Gnome announced their retirement, and Hummingherd's Quech22 was named on arrival. 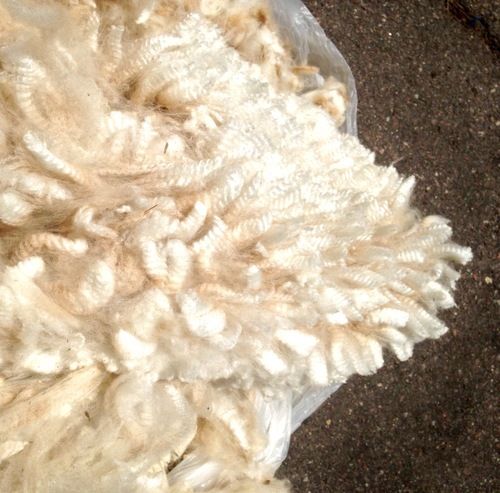 From early on, Quech22 was recognized as having a spectacular fleece commonly referred to as "silky". 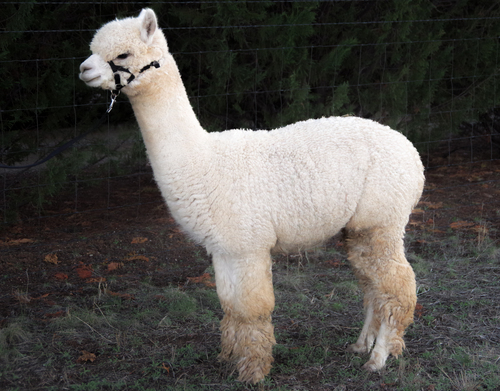 Typical "silky" traits include excellent density, long staple, and uniformity, but he was not shown much because the rare fleece style can be difficult to judge. 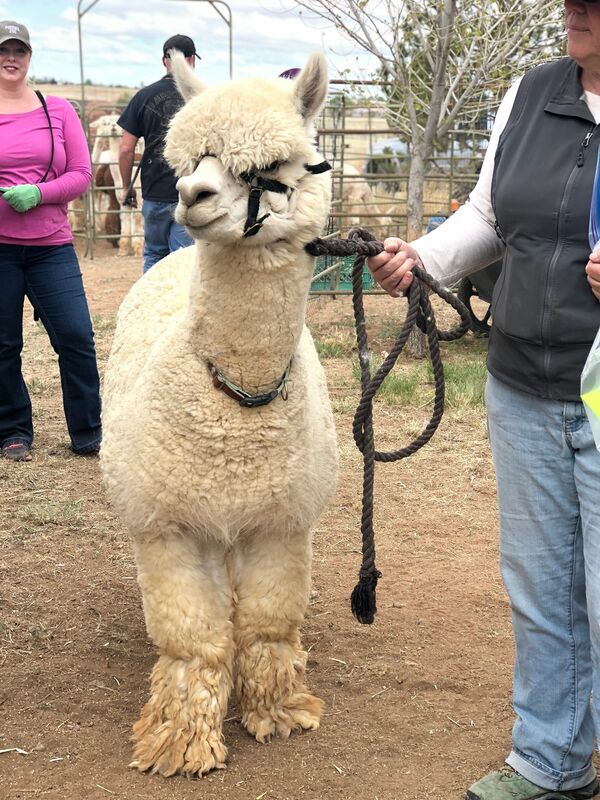 Into adulthood, Quech 22 has produced a more traditional fleece, and at that time was awarded the first place ribbon at the AOA National halter show. As Quech was "coming of age", Hummingherd's farm was in the process of entering retirement themselves, and consequently, he got a late start to his breeding career. All of that has now changed, but he's one of the few greats owned by two small farms that want to see his genetics made available. Quech22's impeccable conformation and elite fleece traits were validated at the 2017 AOA National Show when Judge Amanda VandenBosch awarded him 1st place in halter. At the 2018 AOA National Fleece show, he took 2nd place behind cousin Snowmass Loro Piana, just ahead of his sire Elite Legend in 3rd. All 3 are descendants of the famous Snowmass Quechua. 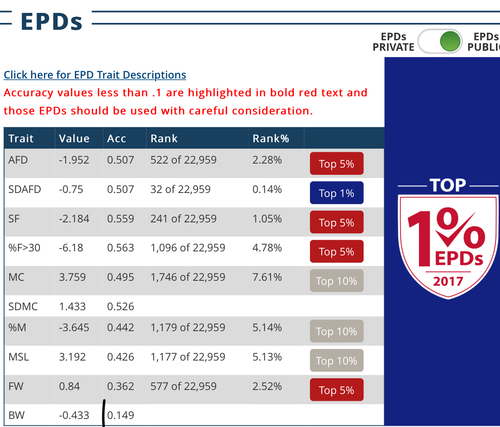 When searching the AOA EPD database for the most EXTREMELY uniform white males in the country (SDAFD < -.75), there are less than 20 sires returned. In that list are modern day legends like Escondidos Makulu, Snowmass Defiance, Snowmass Elite Legend, and Hummingherd's Quech 22. When that list is sorted by fleece weight, Quech22 stands above his peers (including sire Snowmass Elite Legend). 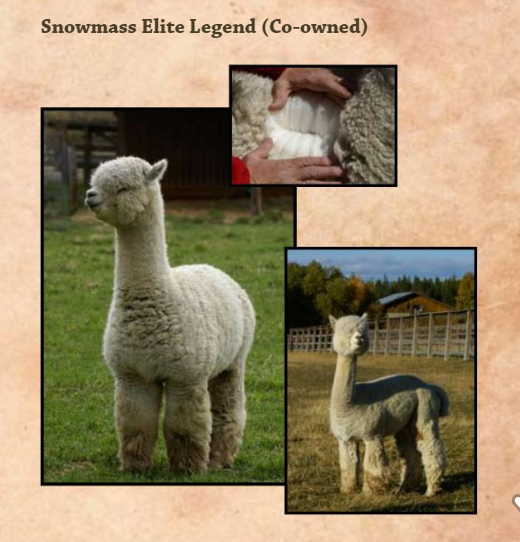 While his uniformity is statistically the same as his sire's, and better than his grand-sire's (Snowmass Quechua), his longer staple adds additional fleece weight that produces much more of the elite fleece his lineage is famous for. Quech22 exhibits phenomenal phenotype! Conformation is exceptional with a solid frame, very full coverage down to his toes and that perfectly typey head. Histograms prove elite fineness and uniformity in the annual high weight clips. EPDs indicate progeny will have EXTREME improvement in uniformity, fleece weight, and fineness. This is the male that carries genetics typically reserved for an elite few farms and has the proven (data-backed) potential to transform any herd in the world. Our goal is to pair Eastwind's Snowstorm with some of the densest females we have found to produce daughters with exceptional fineness and curvature. Those daughters will be paired with Accoyo America Apocalypse and Hummingherd's Quech22 to produce world class offspring with an exceptional combination of traits rarely seen. What are your goals? Most livestock breeders dream of a Stud that surpasses all others. This is the guy to help you turn those dreams into reality for your farm. Don't miss the Quech of a lifetime! 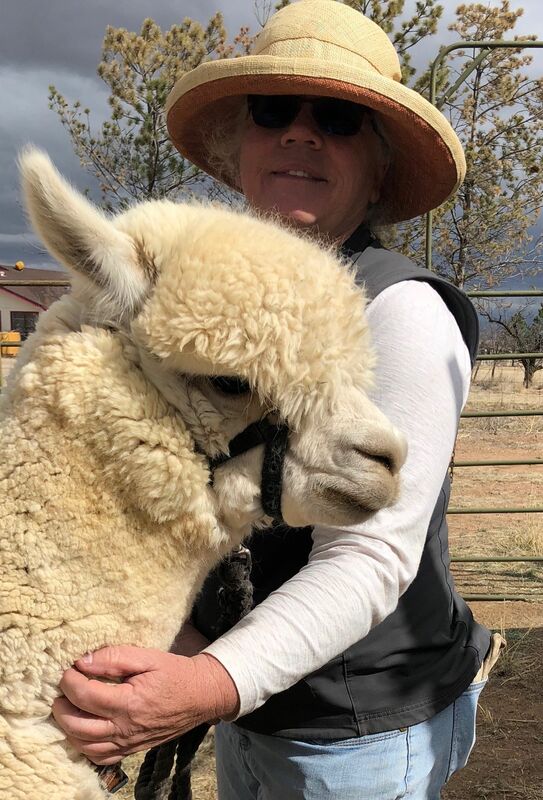 Quech 22 is Co-Owned and can be found splitting time between his Western Home at Peaceful Prairie Ranch or his Eastern Home here at Apple Mountain Alpacas. How Does Quech22 Fit Your Breeding Program? Some focus on pedigree and show winnings. Quech22 is a National blue ribbon winner with a legendary show-winning heritage. That heritage runs deep through multiple generations of legendary show performance. His sire, Snowmass Elite Legend, was described by Snowmass as the "most distinguished" standing stud in the world. Elite Legend was a Futurity Herdsire of the Year, every year, from 2010 to 2016 and was also an AOA National Judge's Choice male (along with 10+ champion banners). Quech22 is also a grandson of the world famous Snowmass Quechua, 2002 Futurity White Color Champion as well as the 2006 and 2007 Futurity Light Herdsire of the Year. Both Elite Legend and Quechua have fathered many of the greatest champions in the industry today. Quech's Dam also has a track record of producing elite, champion offspring. Of her 6 offspring taken to shows, over 11 banners (including Futurity) and a Judge's Choice were awarded. All but one was a blue ribbon winner acquired by farms like Double O' Good, Cas-Cad-Nac, & Magical Farms. What happens when you take one of the top 5 production females who is producing some of the best cria in the country at a Breeder of the Year farm, and breed her with the "most distinguished" stud in the world... Quech22. Not just the best genetics, but the best of the best. Some focus on histograms. Quech22 had a 15.5 micron fleece in year 1 with a 2.6 SD, and only an 18.3 micron fleece with 2.9 SD in year 6 (2018). That's the kind of lingering fineness everyone should be breeding for. Some focus on progeny testing. Quech22 has just started his breeding career but has already produced beatiful offspring that will likely follow in the footsteps of prior generations of legendary show performance and elite offspring. Selection Intensity: How "picky" you are in selecting breeding animals? Generation Interval: How quickly do we put in young, superior individuals? Genetic Variation: How much variability is in the population? Accuracy of Selection: How good are we at selecting the animals with best genetics? 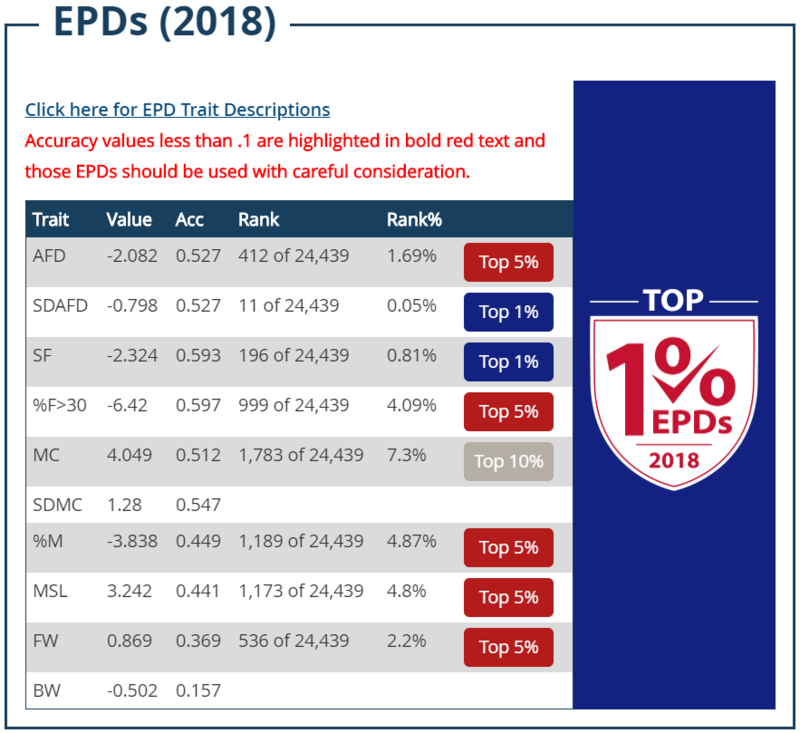 Points #1 and #4 are best identified through study of EPDs that evaluate genetics in ancestors, siblings, and offspring while statistically eliminating the environmental factors. Quech22 is in the top 1.6% for fineness, and sets the bar for uniformity at #11 in the nation (top .05%). He's also in the top 2.2% for fleece weight (which is awesome given his top ranking AFD) and top 5% for staple length. While individual traits are important, we breed for a combination of traits. Quech22 is the #1 male, for uniformity and fleece weight (based on 2018 EPDs - top 15 SDAFD white males sorted by AFW). As breeders, we're not just focused on fineness, but fineness with uniformity, staple, and fleece weight (measured by higher fleece weights at lower micron). This is where Quech22 sets himself apart as the best herdsire in the nation for our breeding goals. Hummingherd's Quech 22 - When You Need Proven, Predictable, Prepotent Genetic Improvement. 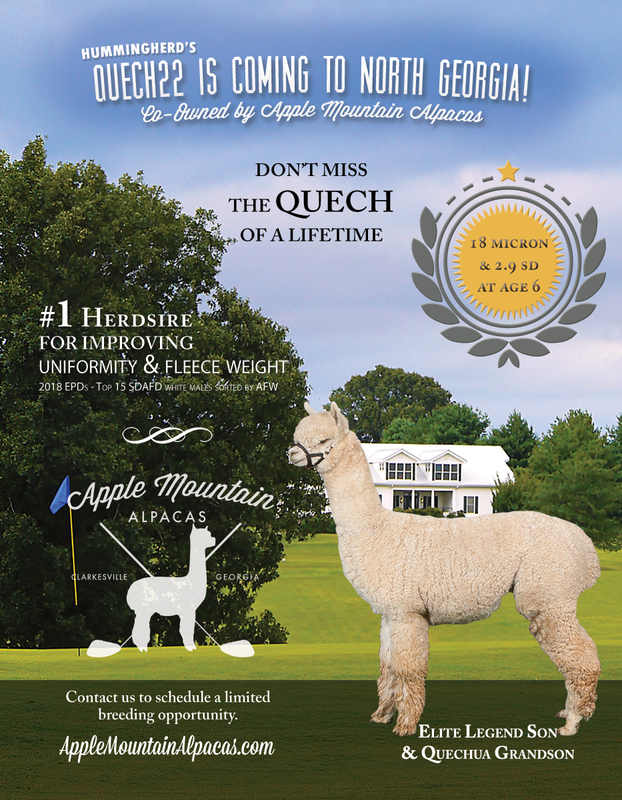 Herdsire with greatest impact on American Alpaca Herds (and top EPDs today). Considered by many to be a top Accoyo import - had 18 micron at 6 yrs.